For the second time in as many weeks, Russian and Turkish fighter jets carried out a joint operation against Islamic State forces in the town of Al Bab in Syria, the Defense Ministry in Moscow said late Thursday. Al Bab, a town still occupied by the Islamic State in the Aleppo governorate, is located just 20km from the Turkish border and has been the focus of Operation Euphrates Shield for Ankara’s forces and Ankara-backed militia to root out Islamic State as well as Kurdish armed groups there. 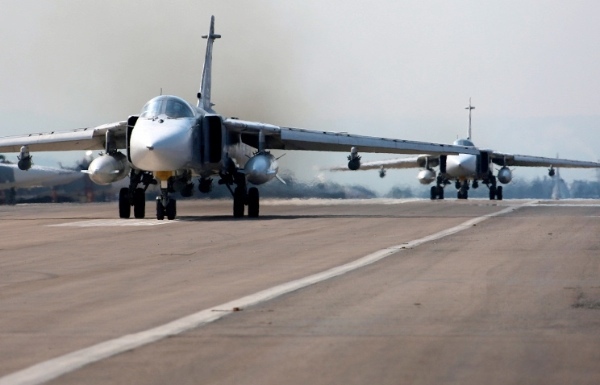 “As a result of this joint operation, Russian jets destroyed three command and communication points, as well as several militant strongholds,” Interfax quoted the ministry as saying. The Defense Ministry said it had destroyed 58 Islamic State targets in that area in the past week. Russia has since the new year stepped up its cooperation with Turkey and the US in the fight to destroy the Islamic State. Earlier this week, the defense ministry said that it had used US intelligence data provided through a “direct line” of communication to destroy Islamic State targets in Syria. Russian and Turkish jets first launched joint air raids on January 18. The joint operations mark a remarkable turnaround in Russo-Turkish ties which faltered just over a year ago when Turkish jet fighters downed a Russian SU-24 bomber in Syria.